Hurricane Ridge is one of the Olympic Peninsula’s treasures. The summit stands over 5,200 feet above sea level, so the road from Port Angeles heads up and up and up. Once at the top, visitors enjoy amazing views of the interior Olympic Mountains, the Strait of Juan de Fuca, and beyond. The view alone is well worth the winding drive. At this time of year, Hurricane Ridge is covered with snow. There is a small ski and snowboard area well suited to skiers of all levels, and many powdery bowls, steeps and glades open to expert skiers and snowboarders. Folks who normally head to the Cascades may be surprised by all Hurricane Ridge Ski and Snowboard Area has to offer these days. For many of us, the best part of winter sports is the Après Ski that begins once the skis and snowboards are securely loaded on the car. We hope that those of you planning to ski at Hurricane Ridge this weekend will stop by Olympic Peninsula Wineries for our annual Holiday Open House. Consider it a fresh twist on an old tradition. 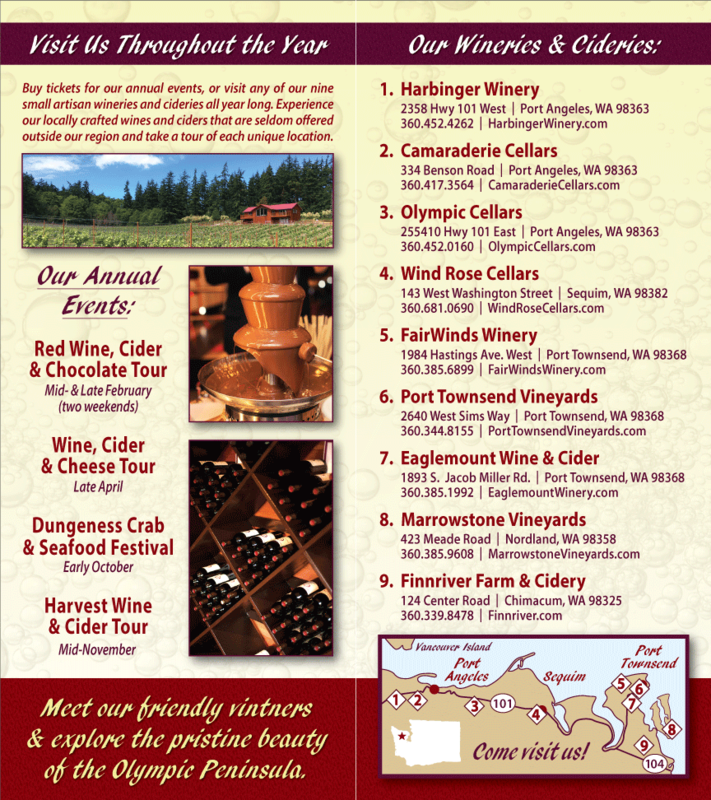 The Holiday Open House takes place from noon to 5 p.m., November 10 and 11, 2011, at all eight of our Olympic Peninsula Wineries and Cideries. Harbinger Winery, Camaraderie Cellars, Black Diamond Winery, and Olympic Cellars are all located in the Port Angeles area. Eaglemount Wine & Cider, Finnriver Farm & Cidery, Sorensen Cellars, and FairWinds Winery are located in or outside of Port Townsend. All are perfectly situated for Après Ski wine tasting. The Holiday Open House is a great time to hand-pick Washington State Wines for holiday parties. It’s also a great time to select wines for gifts. Visiting the individual wineries allows you to taste the wines you normally only look at on the shelf. It’s a fantastic opportunity.